The room was filled with flashing lights that created a disco ball effect, music and happy kids. This had the vibe of a roller skating party from my youth. It was in fact the Wednesday night “dance for your meds” party at the Ronald McDonald Camp Wellness Center. Taking medicine typically isn’t fun – especially if you’re a kid and your medicine doesn’t taste very good — but the Wednesday night “dance for your meds” party was fun. Ronald McDonald Camp is for kids with cancer and their siblings. The dance for your meds party was a great reminder that almost anything can be fun. It’s our job—whether we’re at camp, home or work–to make sure of it. Most nights each camper and counselor in our cabin talked about his highs and lows for the day. It was a great way to see what kids were enjoying and learn what we should do to make the next day even better. Our family has adopted this practice at home before our son goes to bed. It’s interesting and often funny to hear our 4 year-old son’s highs for the day (we don’t do lows yet). And, he loves to hear ours as well. I saw an older camper take the time to explain to a younger camper with a similar problem why things could work out and coach him towards accepting and embracing his opportunities. The older camper used his energy to reach out to others and it was obvious he felt great about it. Feeling down? Want to get a burst of happiness? Research shows that helping someone else boosts happiness. Also, when you help other people, you can’t help but be in the moment. Camp is one of the few places where I’m not thinking about work or other things. I’m completely focused on making sure every camper has the best possible time. I think you’ll find the same thing when you volunteer. One of the counselors read a letter from a former camper. The camper wrote that years ago the counselor inspired her to be ambitious and go out and have an impact on the world. The counselor had no idea she had this impact. Whether it’s a week of camp or even just a few words, you don’t know the impact you have. The little things and small acts of kindness are the big things, so make your words and actions count. I’ve always known that the vast majority of people are awesome, and Ronald McDonald Camp reinforced that. Before camp, my wife picked up 33 rolls of Duck Tape for me to use for a Duck Tape wallet class. At the store there was a special Duck Tape display with employees from Duck Brand. The employees asked what my wife was doing with all of that tape. When they found out about camp, they gave her a huge discount. Later that day, my wife was at Walmart. I had asked her to get me a magnificent cape if she saw one, and Wal-Mart had a giant red cape. When she tried to buy it they told her it wasn’t for sale, because of a defect. However, when they found out it was for camp, they gave it to her for five dollars (a fabulous deal on a cape like that). Music producers Rotation Records came to camp to help students make CDs and music. Custom cake makers, Couture Edible Designs spent a week baking a beautiful cake that fed the 300 plus campers and counselors for our last night celebration. The employees of Ground Zero Salons came up to provide salon services before our party night. Seems like everyone who heard about the camp found a way to help. We just had to ask. When I told people at home that we woke up campers who didn’t want to get out of bed with a leaf blower they thought it was mean. “Come on, those kids have cancer.” But the kids loved it. One kid wouldn’t even get out of bed without the leaf blower sending air under his covers. 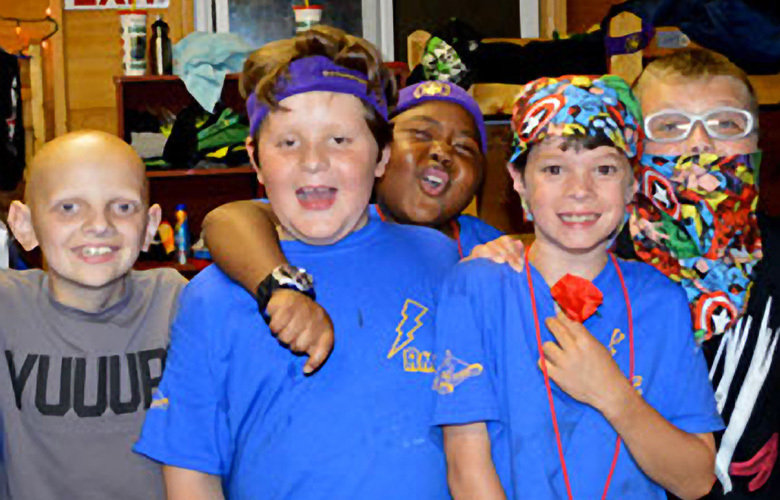 We heard over and over again from the campers that they enjoyed being treated like “normal” kids. Many of the counselors went from working in an office all day to running around with young kids in the heat for a week. It was awesome. Most counselors seemed exhausted by the end of camp, and many said they did more than they thought was possible (including me). That’s because we were surrounded by an energized team. The company you choose impacts what you can achieve and how you feel about it. Surround yourself with positive people who inspire you and you can achieve more than you expect. The Long Branch Harley Davidson Club and Jersey Shore HOG (Harley Owners Group) rode up to camp. A two-hour drive that the bikers had made the prior year in the rain (in fact, they’ve been making it for the past several years). When thanked for coming the bikers said this was the best ride of the year and that they wouldn’t miss it for anything. They love being with the kids for lunch and letting the kids sit on their bikes. They also raised about $30K for the camp this year. Some people might make a judgment about the bikers and the way they look. Unless the judgment is that they’re fantastic, it would be incorrect. One camper said he was lucky. He looked at someone with much more severe problems related to illness and said he had it good with his cancer. Everything is a matter of perspective. I’ll try to remember that the next time I’m stressed. This blog post goes out to the campers and their families. It also goes out to the donors and staff who make camp possible and the 100 plus volunteers who contribute to the fantastic week of Ronald McDonald camp. You’re all my heroes! If you enjoyed this post, please consider clicking this link and liking my Facebook page. You’ll be helping support my upcoming book, 100 Reasons to Smile, and you won’t miss my next good news post (I tend to post monthly). Thank you!